Section 1. The name of this organization shall be the Southern Section of the Classical Association of the Middle West and South (hereinafter known as Southern Section). Its territory comprises the Southern states of CAMWS (AL, AR, FL, GA, KY, LA, MO, MS, NC, OK, TN, TX, SC, VA, WV). Section 2. The primary purpose of Southern Section is to provide an additional meeting opportunity in the south. 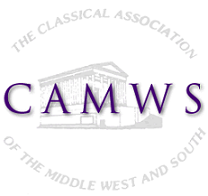 In addition, the Southern Section works closely with the officers of CAMWS to promote the study of Classics in the states of the Southern Section, including strengthening of ties between schools and colleges, and donation of funds for scholarships and government advocacy. Section 1. The elected officers shall be a President, a Vice President, a Secretary-Treasurer, and an elected member of the Executive Committee. Section 2. The President and the Vice President shall serve for a term of two years; neither officer shall be eligible to succeed himself or herself immediately. The Secretary Treasurer shall serve a term of two years and is eligible to succeed himself or herself. The Executive Committee shall consist of the elected officers of the Southern Section. The Executive Committee is empowered to plan and administer the affairs of the Southern Section in the intervals between meetings of the organization. The membership shall consist of those members of the CAMWS residing in the territory of the Southern Section. Section 1. The Southern Section shall meet in even-numbered years. Section 2. The Secretary Treasurer shall arrange the program of the meeting in consultation with the Executive Committee. Section 3. The Secretary Treasurer is empowered to plan the location and other logistics of the meeting in consultation with the Executive Committee. This constitution may be revised or amended by a two-thirds vote of the members present and voting at any business meeting of the SS, provided that the text of all revisions or amendments is distributed to the membership at least thirty days before the time of the meeting.